First, it is important to understand what osteoporosis is. Osteoporosis is a clinical disease that results in the deterioration of your bones, making them weak, brittle, and fragile over time. An increased loss of bone mass and strength also occurs. The disease is often called the “silent disease” because it may occur without any symptoms in the beginning stages. Symptoms often occur when the disease has begun to take a toll on an individual in the form of fractures or broken bones that have resulted from bumps or falls. Menopause is a period in which a woman stops ovulation, halting monthly menstruation and dramatically decreasing estrogen levels. When estrogen levels are low, bone density is decreased. This direct result is a large reason why menopause plays a crucial role in the development of osteoporosis. How Does Dr. Torbati Treat This Issue? 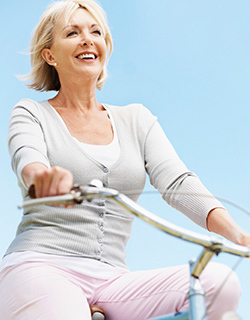 Whether you have osteoporosis or not, it is important to take measures aimed at restoring the estrogen levels that have dramatically decreased in the body. This can be managed through the use of different treatment options including HRT, or hormonal replacement therapy. However, HRT is not always recommended for women who are trying to prevent osteoporosis as HRT comes with it’s own set of risks. That is why it is important to consult a professional such as Dr. Torbati who will work with you to manage your estrogen levels and take measures aimed at the treatment or prevention of osteoporosis.